Originally published in 1966 and now recognized as a classic, Norman O. Brown's meditation on the condition of humanity and its long fall from the grace of a natural, instinctual innocence is available once more for a new generation of readers. 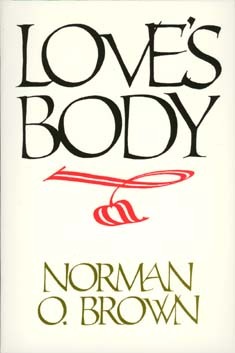 Love's Body is a continuation of the explorations begun in Brown's famous Life Against Death. Rounding out the trilogy is Brown's brilliant Apocalypse and/or Metamorphosis. Norman O. Brown (1913-2002) was Professor of Humanities, Emeritus, at the University of California, Santa Cruz, and author of Life Against Death: The Psychoanalytical Meaning of History.